During the 42nd General Election, Justin Trudeau’s Liberals released a campaign pledge to impose a carbon tax on all of Canada. Outlined in his party’s platform, “New Plan For a Strong Middle Class” on Page 39, “We will provide national leadership and join with the provinces and territories to take action on climate change, put a price on carbon, and reduce carbon pollution.” It should have read “We will force a massive tax grab onto the provinces and territories”; for actions speak louder than words and this is exactly what Trudeau is doing. But what Trudeau and his top aids (including, but not limited to, Gerald Butts) have failed to realise is that carbon is not a pollutant. Carbon is a naturally occurring element and is listed on the periodic table of elements with an atomic number of 6. We, as Humans, are also carbon-based lifeforms. Carbon is the 15th most abundant element in the Earth’s crust, and the fourth most abundant element in the universe by mass after hydrogen, helium, and oxygen. Carbon’s abundance, its unique diversity of organic compounds, and its unusual ability to form polymers at the temperatures commonly encountered on Earth enables this element to serve as a common element of all known life. It is the second most abundant element in the human body by mass (about 18.5%) after oxygen. If the Trudeau Liberals were serious about fighting actual pollution, would it not be prudent to take the fight to the landfills and illegal dumping of raw sewage into our rivers and lakes? The argument in favour of the imposition of a carbon tax is that the additional costs would provide a disincentive to companies (and families) to burn fossil fuels. It will not reduce our dependency on fossil fuels; indeed, the companies will pass on this added cost directly to you the consumer. Necessity trumps ideology; you will pay to heat your home throughout a harsh, cold Canadian winter. Even if we can believe this government when they claim that all monies raised will go directly towards reducing Greenhouse Gas (GHG) emissions — forgetting for the moment this government has lied time and again, do you really think that a reduction in our GHG emissions will help with the battle of climate change? When one considers that all of Canada’s total contribution to the production of GHG emissions is 1.58% of the world’s total GHG emissions, it leaves one to wonder just what the Liberal Government hopes to accomplish. Consider China’s GHG emissions; China emits over 25% of the world’s total. Why should Canadians have to pay more to reduce our negligible contribution? We’re already one of the greenest countries. 25% dwarfs 1.58% — simple as that. So follow the money; this tax will cost the average Canadian an estimated $2,569 per year. 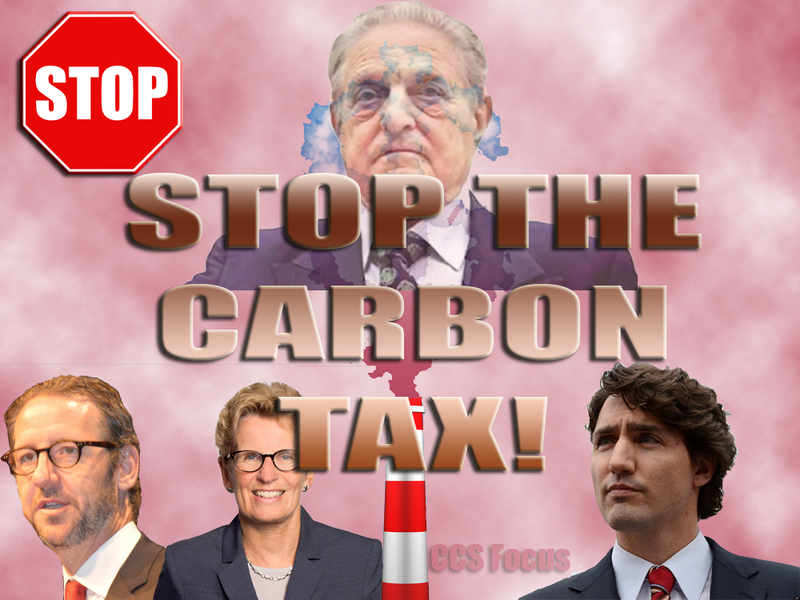 The imposition of a carbon tax is a historically massive tax grab by a government desperate to give the appearance of good environmental stewardship. In a few years, you’ll have a multi-billion dollar industry and a huge revenue tool for the government paid for by the taxpayer. Just ask David Suzuki, George Soros and Al Gore about it; they’ve made millions from this ‘climate scare’. Hmmm… I don’t like helium; it’s bad for the environment because it makes your voice funny. Think I could make a multi-billion dollar industry fighting helium? If you think that this idea is outrageous then ask yourself, why carbon? Did Maurice Strong adorn a blindfold and toss a dart at the periodic table of elements? Did the dart happen to land on carbon or what? Rather than just complaining about this unfair and massive tax grab on the Canadian taxpayer; let’s do something about it. We need to consult with a constitutional lawyer. Please sign this petition put forth by the Canadians’ Taxpayer Federation. Please consider donating to this cause. We need to hire a lawyer and lawyers are expensive. But if we can stall or stop this legislation, we should and must pursue this endeavour for it will save Canadian Families from paying into an unjust tax grab that will do nothing to help the environment.